Yesterday Mike and I dug a tree stump out of my dad's front yard. (Okay... Mike dug the hole and got the huge tree stump out. 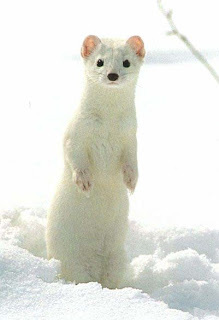 While I was shoveling the dirt back into the big hole I asked my dad what an ermine was. He said it was a stoat. I then asked what a stoat was. He said it's a weasel. Then I said that that must mean that the worm that I just saw wasn't an ermine because I was totally going to say "look at that gross ermine" and then I would have been wrong. I would name THAT Richard. Not Ermine. Then we started talking about building traps by digging holes and covering them up with hay so that someone falls into it. Apparently my dad did this to his dad and even though my grandfather almost broke his neck my dad says that it was hilarious. So I said that dad should have been a musketeer. And dad asked why he would be a Mouseketeer. And I said like Davy Crockett. And I said that's what I meant. And then Dad started singing the Davy Crockett song so I joined in and started screaming "Fe-fi-fidily-i-oh, fe-fi-fidily-i-ohohohoh" and Dad said that that's not the Davy Crockett song. And I said I was pretty sure that good ol' Davy was in the kitchen with Dinah. And then I asked if Davy at least played the banjo. And then I decided that maybe Davy Crockett should have played the banjo in that kitchen with Dinah because if he had a hobby like playing the banjo then maybe he wouldn't have killed all of those animals for hats and instead joined a band. So, overall... I was wrong a lot yesterday. Suscribe to Ally B Speakin!